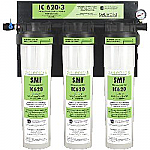 Sanitary Quick Change Replacement Cartridges for your Contamin-Eater Whole House Water Filtration System. Two 10" SQC Replacement Cartridges for the SMF Contamin-Eater 710-2 FL One cartridge with fluoride reducing media; one with Hollow Carbon. Sanitary Quick Change Cartridges mean you can change them yourself with NO TOOLS NECESSARY! 50,000 gallon capacity for chlorine. Two 14" SQC Replacement Cartridges for the SMF Contamin-Eater 714-2 FL One cartrdige with ABA2000 media; one with Hollow Carbon. Sanitary Quick Change Cartridges mean you can change them yourself with NO TOOLS NECESSARY! 70,000 gallon capacity for chlorine. 14" Sanitary Quick Change Replacement Cartridge for our SMF Contamin-Eater 720. 20" Capacity:100,000 gallons. Two 20" SQC Replacement Cartridges for the SMF Contamin-Eater 720-2 FL One cartrdige with fluoride reducing media; one with Hollow Carbon. No tools required for cartridge replacement. 100,000 gallons for Chlorine; 30,000 for Chloramine. * High Flow Rate of 10 GPM * 200,000 Gallon Capacity for Chlorine; 62,000 for Chloramine.